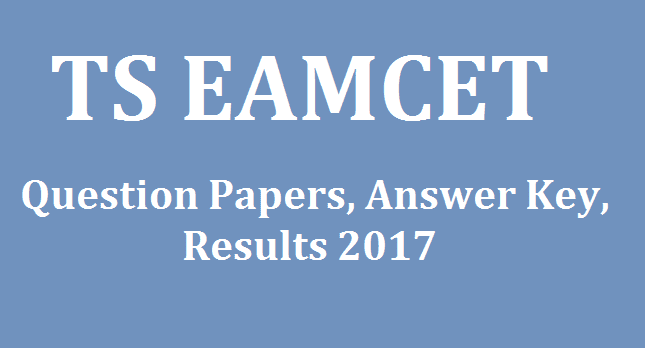 TS EAMCET 2017, Telangana EAMCET Question Papers, Answer Key, Results 2017,Telangana EAMCET Answer Key 2017,TS EAMCET 2017 Notification, Schedule, Apply online @ https://eamcet.tsche.ac.in.The Telangana government is going to announce schedule for fresh exam for admission to engineering and agriculture courses in the state. As per the new schedule announced by the Telangana State Council for Higher Education, EAMCET (Engineering, Agriculture, Medicine Common Entrance Test) will be held in May, from 10 a.m. to 1 p.m. The council appointed Jawaharlal Nehru Technological University (JNTU) registrar as the EAMCET convenor. The state will be conducting EAMCET for admissions to professional courses. TS EAMCET Engineering, Agriculture & Medical Common Entrance Test (TS EAMCET) is conducted by Jawaharlal Nehru Technological University Hyderabad on behalf of TSCHE. This examination is the prerequisite for admission into various professional courses offered in University/ Private Colleges in the state of Telangana. 1) Candidates are required to download Hall Ticket afresh for appearing for TS EAMCET 2017. 2) This is only a Notification for entrance test. Candidate has to fulfill the eligibility criteria for admission as laid down in the relevant G.Os at the time of admission. The application form cost is Rs 250. This time candidates can apply till two days before of exam date with late fee of Rs.10,000. But these candidates will be allotted centres at Hyd, Secunderabad only. The exam pattern is same as last year. 1. For engineering Maths-80 Marks, Physics-40 Marks, Chemistry-40 Marks. 2. For others Botany-40 Marks, Zoology -40 Marks, Physics -40 Marks, Chemistry - 40 Marks. Paper will be set according to the marks allotted to that subject. EAMCET exam will be conducted separately for Agriculture and medical admissions. Ranks will be decided according to the marks secured in inter and EAMCET. 25% - Inter, 75% - EAMCET. In this test qualifying marks are 25% but this will not applicable for SC, ST Students. (a) Engineering (E):10.00 A.M. to 1.00 P.M.
(b) Agriculture and Medical (AM):2.30 P.M. to 5.30 P.M.
#Visit the official website of TS EAMCET 2017 (link will be provided here). #Click on the link related to “TS EAMCET Results 2017”. #A new page will open on the screen. #Candidates are required to enter their Hall Ticket Number. #After filling the details, click on the “Submit” button. #The result will be displayed on the screen. #Print and download the result. #Students are advised to take extra printouts of the result and keep it safe for further admission process.